Inspired by the Botanical garden's vibrant colors, beets were arriving by the bagful. A purée of roasted beets, some sour cream and lovely scented buns appeared like magic. Last week, Mom and I finally made it to experience our gorgeous Montreal Botanical garden. Some of it was familiar, however, some masterpieces on the scene were unforgettable. The International Mosaicultures creations were featured throughout several acres of terrain. Here is a small gallery you may enjoy as well. After much oohing and ahhing at some very unique and fabulous creations, we sadly left the gardens. Back at the kitchen, a bag of beets was begging to be put to good use. Since cooler weather is upon us, it had finally convinced me to crank up the oven again. I decided to get some beets roasted so that a few recipes would get made within a short time frame. Meanwhile, I went back into my recipes and realized I already had the perfect bread bun selection. Not too long ago I had proudly shared my first sweet potato sour cream buns with you. A purée of beets would be perfectly suited to this recipe. 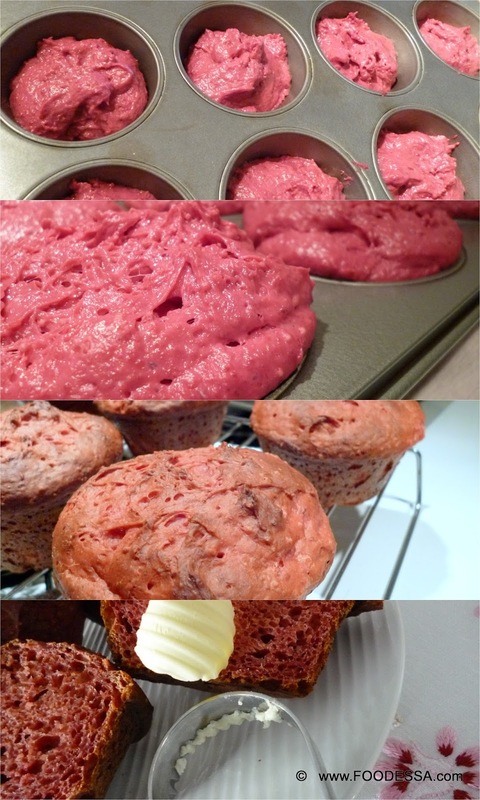 This time, I would use a muffin pan instead. * note: replace beet purée with any other flavourful puréed vegetable: Squash, Sweet potato etc.
. Position the oven rack on the second level from the bottom. Prepare and generously grease a 12 unit metal pan like for muffins or small squares. Set aside. 1. In a medium bowl, beat the egg and salt. Whisk in the beet purée to combine. Set aside. 2. In a large bowl, combine the first portion of flour (1 cup /150g) along with the sugar and yeast. Whisk and make a well. Set aside. 3. Meanwhile, in a small pot, combine and warm the sour cream, water and butter on low-medium heat. Give it a stir every so often. When the butter has completely melted it has basically reached the proper temperature. 4. Remove the pot from the heat and immediately add this liquid mix to the flour mix while briskly mixing with a heavy whisk or solid spatula for about 30 seconds. Now, blend in the puréed beet mix. 5. Afterwards, also add the remaining flour by continuing to combine the flour until all flour traces have disappeared. Don't over mix. pre-heated oven, for 24 minutes in a dark pan. Adjust a few minutes less for a lighter pan. Remove the breads from the pan as soon as possible and let them cool on a metal rack. I hope you enjoyed a small slice of our beautiful Botanical garden.